What weapons has Crimea received after reunification with Russia? A Su-30SM fighter jet on a training mission. The peninsula’s rearmament will allow Moscow to control Black Sea basin. Since 2014, Moscow has modernized its entire range of armaments in the Crimea, from shore-based missile complexes and air defense systems, to ships and submarines equipped with Kalibr cruise missiles. According to experts, Russia has taken the rearmament of the peninsula seriously because of the Crimea's strategic importance for the country's defense capability. After the collapse of the Soviet Union in 1991, the naval base in Crimea was leased to Moscow, but any upgrade to the fleet had to be rubber-stamped in Kiev first. According to Igor Kasatonov, former commander-in-chief of the Black Sea Fleet, Ukraine's policy during this period was one of squeezing Russia out of Crimea. However, after the peninsula became part of Russia in 2014 the situation changed and a full-scale reform of the fleet began. "We immediately began to upgrade the Black Sea fleet with Project 11356 warships and Varshavyanka-class (Project 636.3) diesel-electric submarines. They have all been fitted with Kalibr cruise missiles and have already taken part in the Syrian campaign," Kasatonov said. But they are just one part of the armaments deployed in Crimea. Project 11356 frigates of the "Admirals" series have arrived in the region in the past year, fitted with Kalibr cruise missiles with a strike radius of 2,600 km. Just six months after coming into service, some of them joined the operation headed by the Admiral Kuznetsov aircraft carrier to Syria. In 2015 two of the small Project 21631 Buyan-M missile-armed corvettes joined the Black Sea Fleet. They are multi-purpose vessels which, unlike their "big" brothers, can operate in shallow waters and coastal areas of the Black Sea and Mediterranean. They are equipped with A-190 naval artillery guns, Duet anti-aircraft systems, and Oniks anti-ship missiles. They are to be joined by Project 22800 Karakurt missile and artillery corvettes for use in areas close to the shore. In addition, the flagship of the Black Sea Fleet - the Guards Missile Cruiser Moskva - is to be modernization in 2018. Subsequently, the Black Sea Fleet has received more than 40 ships and support vessels and acquired more ships than other Russian fleets, according to 2016 figures. The sixth Varshavyanka-class (Project 636.3) diesel-electric submarine fitted with Kalibr cruise missiles came into service in the region in October 2016. However, the procurement of the subs has made it necessary to build infrastructure for them. The last of the moorages for the submarines are still under construction at Novorossiysk (1,500 km south of Moscow). And while four of the subs are in harbor, the remaining two are on duty at sea. "A drawback of the new base is the weather conditions - it is subjected to northerly winds blowing from the Caucasus Mountains. The gusts are capable of damaging coastal buildings and even beaching ships," said retired Colonel Viktor Litovkin, military analyst at the TASS news agency. He added that Russia was building an additional tunnel in the Caucasus to eliminate the threat of damaging winds. 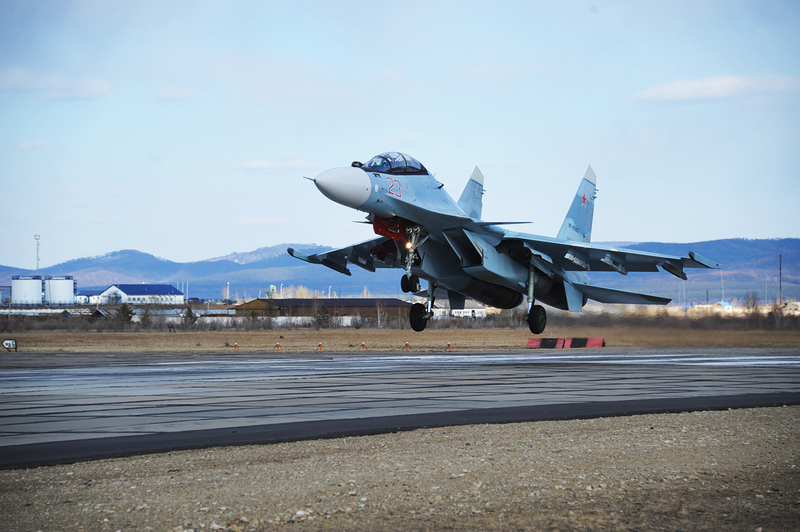 Thirty Su-30SM "generation 4++" heavy multi-role fighter jets joined the military district a year after the peninsula's reunification with Russia. The planes can detect and track up to 15 airborne targets, and direct fire on four of them at a time. Moreover, the plane can carry up to eight tons of air-to-air guided missiles, unguided aerial bombs, and other weapons, which can be installed on its 12 attachment points. These planes will eventually replace the Su-24 bombers stationed in the peninsula. At the start of the year the skies above Crimea were under the watchful eye of S-400 air defense systems. In addition, Pantsir-S missile and artillery systems have been sent to the region. And, according to military experts, in the coming years the missile defense "umbrella" will be reinforced by the Buk-M2 and Tor-M2 systems. Any threat coming from the south west (the direction of Turkey and the Bosphorus) is protected by the Bastion and Bal anti-ship systems. They are fitted with subsonic low-altitude Kh-35 missiles, which can strike targets at a distance of around 130 km in all weathers. "The Crimea is a strategic element of Russia's defense capability. Who controls the peninsula controls all the waters of the Black Sea and whatever is happening on the territory of adjacent states. Russia will be able at any moment to dispatch its fleet and put a stop to any possible intervention," said Izvestia newspaper military analyst Dmitry Safonov. He believes that "post-Soviet stagnation" and tensions on the international arena have forced the Russian Defense Ministry to urgently modernize the peninsula's entire military infrastructure. "At the moment we are squaring off with NATO over the European missile defense system and the alliance's future base in Bulgaria. If we fail to come to an understanding and find common ground, the arms race in the region could intensify, and this would have consequences for the economies of all countries involved," added Safonov. Read more: Will Russia and the U.S. enter into another arms race?